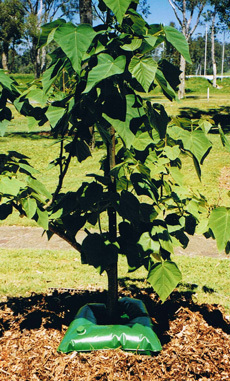 The Ecobag is a TREE WATERING system for irrigation of young trees and shrubs. 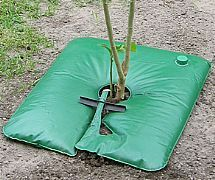 Designed specifically for Australian conditions, Eco Bags is a drip watering system - it waters and fertilises young trees for up to one month; prevents evaporation, stops weed growth near the tree and increases survival rates when mass planting trees in remote places, or where there is a short supply of water. Your Trees and Shrubs need never be thirsty again! The perfect plant and tree watering system. Can be used on Roses, Lilly Pilly, Viburnum, Fruit Trees, Hydrangea, Azalea, Birch, Crapemyrtle, Magnolia, Mockorange, etc. Water Saving Device, Tree Watering system for watering young trees, automatic tree and plant drip irrigation system, waters and fertilises young trees for up to one month, prevents evaporation, stops weed growth, increases survival rates when mass planting trees in remote places. Copyright © 2019 Eco Bag Industries All rights reserved.